There are 7 adjustable settings built into the TurboTweak Velosyty chip for the GMC Syclone and Typhoon. This article will cover all the software and hardware settings in the chip. 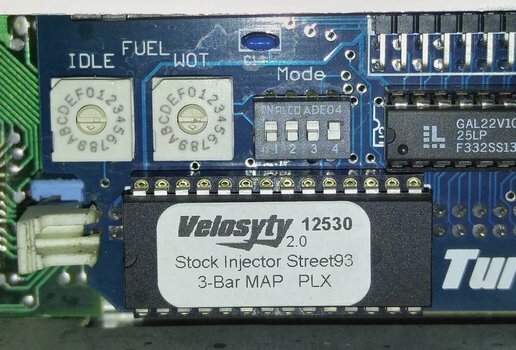 This article is based on content of the Velosyty Version 2.0 chip documentation. Their docs are available on their site in pdf format. You'll need a scan tool that can display INT and BLM (or LTerm) to make adjustments outlined in this article. Warm up the truck by running it for approximately 15 minutes. Connect a scan tool and verify all the sensors are reading in the correct ranges. The manual says these starting points are crucial to the Velosyty chip! These settings change parameters that are critical to the safety and performance of your engine. Changing these settings can cause serious mechanical failure to your engine if done without care and paying close attention to your air/fuel mixture and knock retard values. Turn the key to the on position. Again, not running! Monitor the value for INT in your scan tool. It should display 0. If you mess up, turn the key off and begin again. Continue holding the gas pedal. After 2 seconds you'll see the INT value begin to cycle from 1 to 7 and back to 1. After releasing, wait a few seconds and verify your selection on the scan tool. Write down your settings. If the ECM loses power, they get reset! The BLM (sometimes displayed as LTerm) on your scan tool shows the current value for each setting. Use the gas pedal to change the values displayed under BLM. The value will loop around after reaching minimum or maximum value for each setting. Turn the key off to save the setting. Repeat as needed. Wait at least 5 seconds before turning the key on again. Add/Subtracts fuel from default WOT fuel values around 15psi of boost. With smaller injectors, you may already have maximum fuel or close to it, so adding more will have little to no effect. Add/Subtracts fuel from default WOT fuel values around 7psi of boost. With smaller injectors, you may already have maximum fuel or close to it, so adding more will have little to no effect. Add or subtract timing from default values in 1st and 2nd gear at WOT. Be very careful running pump gas and adjusting the timing. Generally the engine will not tolerate more then 14-16 total degrees of timing at full throttle, though 1st and 2nd sometimes will tolerate more. Add or subtract timing from default values in 3rd and 4th gear at WOT (over 55mph). This setting requires MPH signal to the ECM. Without it, this setting has no effect. Be very careful running pump gas and adjusting the timing. Generally the engine will not tolerate more then 14-16 total degrees of timing at full throttle. Add or subtract from the initial boost waste gate duty cycle, potentially changing how fast the turbo spools. Too high of a value will produce boost spikes that can damage your engine. Target max boost in closed loop boost mode. If you're not using the factory wastegate solenoid, this value has no effect. With a wideband O2 installed, set the desired a/f ration at WOT. The chip needs to be programed for your specific brand of wideband, and it's analog wideband output needs to be connected to the F14 pin on the ECM. The TurboTweak documentation has some additional detailed tuning tips for the 7th Closed loop WOT wideband mode. The chip itself has several hardware based settings to adjust. First are the 2 rotary dials for Idle Fuel Trim and WOT Fuel Trim. Unlike the software settings, these stay when power is disconnected. They are blended into the fuel curve so they will have a small effect near their areas of effect at idle or WOT. Again, watch your data logs (you really should have a wideband!). Keep in mind that your software settings will carry over to the secondary program. If you wish to reset the values, disconnect the ECM from power. If you did not order a second program, do not change the dip switch.